In the early 1970s, a New York couple faced one of the most devastating situations parents ever face: their child had cancer. The 13-year-old boy eventually died, and in the aftermath, the couple recalled their experiences at the cancer center where he received treatment. They especially thought about the other patients’ families who slept in waiting rooms because they had no place else to stay. The couple decided to buy a house near the hospital. They arranged for an order of Catholic nuns to operate it as a temporary home-away-from-home for outpatients and caregivers. And without realizing it, they created the first known hospitality house. The Hospitality Houses of Methodist Medical Center provide temporary lodging for patients and families who travel to Oak Ridge for extended medical treatment. Our mission is to help relieve the financial burden associated with such housing, thereby enabling our guests to focus on physical and emotional healing. The houses primarily serve patients of Thompson Cancer Survival Center at Methodist, Thompson Oncology Group and their caregivers. Other patients of Methodist Medical Center and their families may stay at the houses when space is available. All guests must live 30 or more miles from Oak Ridge and must be referred by staff at the cancer center, the medical center or a physician’s office. For information and room availability, please call the Hospitality Houses at (865) 835-4358 between the hours of 8:30 a.m. and 5:00 p.m. For after hours assistance, call (865) 835-1000. The Hospitality Houses bring guests the comfort of home. Our guests stay in one of eight suites, and share the use of the living room, kitchen, dining area and laundry room. The houses offer a place where guests can rest and reflect, whether it is in the privacy of their own room, the comfort of the living room or in one of the houses’ outdoor sitting areas. Cancer patients who stay at the Hospitality Houses receive a special gift when they arrive, a beautiful lap quilt handmade by Ritzy Thimble Quilting Guild. Many patients have found warmth and comfort in their quilts during their stay and when they return home. The houses’ staff and volunteers create an atmosphere in which guests can become part of a larger family. Patients and caregivers have an opportunity to share their feelings and draw strength from one another. That special care is important when people are feeling the emotional, physical and financial pressures of a medical crisis. The Hospitality Houses are a part of Oak Ridge’s original “alphabet” houses. Known as “E” houses, both Hospitality Houses were initially built as part of the development of the “Secret City” during World War II, and have been renovated to accommodate guest stays. 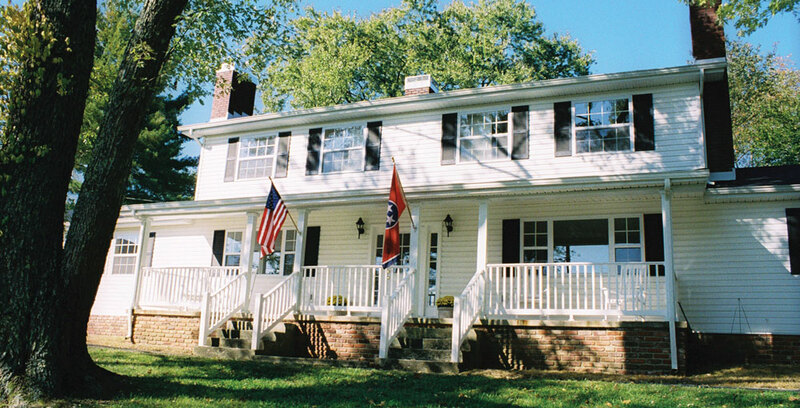 The first house opened in 1997 and is named the Manly House in honor of Bill and Jane Manly, dedicated friends of the house and the community. In 2006, a second house was opened following significant renovations by the members of the Cooperative Agreement of Labor and Management (CALM). In honor of their efforts, it was named the CALM House. In 2017, the third house was renovated and opened thanks to the generosity of many community donors who gave of their time, labor and funds. It is named the UT-Battelle – Pro2Serve House in honor of these lead corporate donors who supported the project. Kimmy Sue Nelson lives in Lafollette, so when she was diagnosed with breast cancer and decided to receive treatment at Methodist Medical Center of Oak Ridge, she needed a place to stay while undergoing radiation and chemotherapy. Not only did Kimmy Sue live two hours away from Methodist and her physicians, she has multiple sclerosis, or MS, and takes medication that makes it almost impossible for her to drive. But thanks to the Hospitality Houses and the resources offered through Methodist Cancer Services, Kimmy Sue found what she later called “a wonderful experience” in one of life’s most challenging times. The Hospitality Houses are supported by the Methodist Medical Center Foundation and offer their services free of charge. So that we may continue this tradition of hospitality, we welcome and rely on the support of the community. Whether it’s with monetary contributions, donations of food or household goods, or through volunteering, you can make a difference to our neighbors, to our community, and to all those seeking shelter in life’s storm. Without your generous support, we could not continue to provide a “home away from home” for people facing a medical crisis. To learn more about how you can help, call (865) 835-4358. Did you know you can support the Hospitality Houses just by doing your own personal shopping? It’s free and easy with Kroger Community Rewards. If you shop at Kroger, register to be Community Rewards member and every visit will help the Hospitality Houses – and it won’t cost you a dime. Click here to learn more. Online donation options coming soon. Please call 865-531-5210 to make a donation by phone. If you would like to volunteer your services or learn more about the Hospitality Houses, please call the Hospitality Houses at (865) 835-4358.